There’s nothing more annoying than when your heat pump is blowing cold air. Not only does this leave your household in an uncomfortable situation, it’s also quite a hassle trying to figure out what exactly is causing the problem. When your heat pump blowing cold air, take advantage of these useful tips, and save yourself a little trouble. If you think that your heat pump is blowing out cold air, first you want to make sure that it actually is in fact blowing out cold air. As nuts as it may sound, the air in your home can feel chilly even though the heat pump may be working completely fine. Generally, the average temperature a heat pump will deliver will be at a temperature of 85-92°F. However, as the air flows out of your vents, it can feel quite chilly. There are a couple different reasons for this. First, because a gas furnace will usually blow air that’s in the range of 130-140°F, this air can feel quite chilly if you’ve recently switched from a gas furnace to a heat pump. Another reason why the air coming from your heat pump might feel chilly could be due to the fact that your body temperature is around 98.6°F and heat pumps blow air that is a temperature below that. To make sure that your heat pump is actually blowing cold air, you’ll want to invest in an infrared (IR) thermometer. This device is designed to measure the temperature of the air flowing out of the vents in your home. You can purchase these devices at most home improvement stores. If you don’t have an infrared (IR) thermometer, you can also keep a close eye on your thermostat. 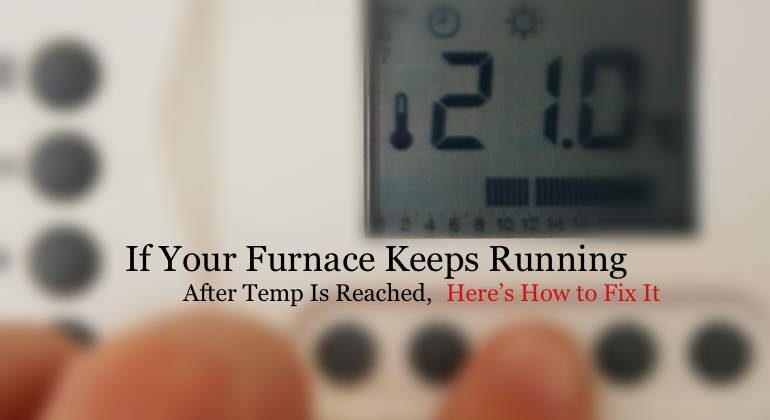 Turn your thermostat up to your desired temperature. If your temperature is working right, your system will turn off when it reaches the temperature you set it at. If your system fails to do this, then you have a problem. When your heat pump is blowing cold air in heat mode, what should you do? Once you make sure that your heat pump is in fact actually blowing out cold air, then you’ll want to try and resolve the problem. To begin, there are two things that you should try and do first. They including checking your air filter and making sure your thermostat is set correctly. Overtime, your air filter can become quite filthy. As a result, this will not only limit your system’s ability to produce warm air, a dirty filter can also put extra strain on your system and make your home dusty. It’s recommended that you change your air at least every 6 months. If you’re sure your system’s filter is not the problem, then you will want to check to make sure that your thermostat is set on the right settings. It’s essential that your thermostat is set to ‘AUTO’ and not ‘ON.’ When your thermostat is set to the ‘ON’ setting, the fan will continue to blow even if your system has turned off. This will result in cold air blowing out of your vents. Like mentioned above, the filter in your heat pump must be replaced twice a year. This will keep your system from blowing cold air into your home. Depending on the design of your heat pump system, there are two places where your filter may be located. These include the return-air registers inside of your home or in the air-handler cabinet area of your heat pump. Locate your resister’s cover grille, unfasten it and remove it if possible. Take the old filter out and dispose of it right away. Get a damp washcloth and wipe the dust away. Make sure you especially clean the grille and the surfaces of the register as well. Insert the new filter. Make sure the arrows displayed on the filter are facing up. Start by cutting the power to your unit. Locate the panel or the door that is guarding the blower. You will need to open it up or take it off. This may include removing screws. Your water heater’s filter will be located next to the blower. Simply slide it out. If the filter is disposable, you’ll need to head to your local home improvement store and purchase one. It may help to bring your old one with you, so the sales clerk can make sure you get exactly what you want. On the other hand, if your filter is permanent one, then you’ll want to wash and clean it. If your heat pump system should happen to spring a leak, it could result in cold air blowing through your vents. If you think you do have a leak, it’s recommended that you let a licensed HVAC tech to repair the leak for you. Another problem could be due to a lack of refringent. Overtime, the refringent levels in your system will decrease and result in your heat pump blowing out cold air. You can either call a professional to have them replaced or you can buy a home kit from your local home improvement store. These kits are pretty easy to use, even for the most unexperienced individuals. Your heat pump has a part built into it called the reversing valve. This valve reverses the flow of refrigerant within your system. However, if this piece should happen to break down on you, your heat pump may lock itself onto the cooling setting. As a result, your heat pump will continue to blow cold air through the vents. If the reversing valve is the problem, it’s best to call a professional. This is a very complex job to fix.